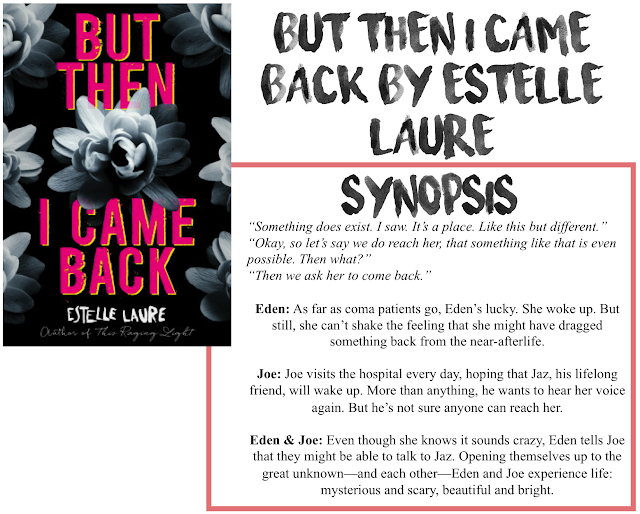 I am back with another book review, today it is But Then I Came Back by Estelle Laure. Thanks so much to NetGalley for providing me with an e-ARC for an honest review. As always, all opinions are my own. I'm not quite sure how I feel about this book. I liked it, but I don't know if I understood it. Basically, the story follows a girl named Eden. After slipping and almost drowning, Eden was left in a coma. But she eventually wakes up. While she is in something she calls the In Between, she sees another girl with her. She awakens to find that that girl, named Jaz, is with her in the hospital, also in a coma. She can't figure out why they are linked or why she keeps seeing these black flowers all over the place. As Eden tries to re-integrate herself into the world, she struggles to open up and figure out what is really going on. Like I said, I did enjoy this book. Eden's character and backstory become well-developed and I found myself invested in her story. I read the book in one sitting, so there must have been something to grab me. I also liked the romance between Eden and Jaz's friend Joe. I thought it was a good, slow burn that was complicated enough to keep things interesting. I can't put my finger on it, but something about Joe felt off. I don't know if that's just me or what. Now comes the part where I get a little unclear in my idea of the story. Part of me wants to say that this is all a delusion of comatose-Eden. The other part of me wants to say that Joe and Jaz didn't exist, but then how would you explain the hospital staff talking about them? For a while, I thought maybe Jaz was a dissociative personality of Eden, but I'm not sure on the logistics about that either. Something about this story just screamed unreliable narrator (she does, after all, have a brain injury). But I couldn't tell you I have any real proof of that. All I know is that things felt off. Laure's writing style is brilliant, it drew me in right away and I didn't put it down until I was done. I was not aware this was the companion novel to This Raging Light, so maybe some of my concerns are cleared up in book one. I think this book stands alone fine on its own, not having read TRL, I can't say if it would be better to read them "in order" but I think this one is complete by itself. Overall, I enjoyed this book, but I just felt like there was something a little deeper I was missing.